This phrase is usually (and understandably) taken to refer to a seventeenth century Japanese sculpture that sits over the door of a shrine at Toshogu. Here's a picture. Why monkeys? Because the Japanese phrase for hearing, seeing and speaking no evil is mizaru, kikazaru, iwazaru, and zaru is pronounced the same as saru, which means monkey. Hence the sculpture. This is the explanation given in all the dictionaries as the origin of the phrase Hear no evil, see no evil, speak no evil. It's all very well, but what about this passage from a letter of Thomas Paine in 1802? As to the hypocritical abuse thrown out by the federalists on other subjects, I recommend to them the observance of a commandment that existed before either Christian or Jew existed. "With thine eye, that it beholds no evil. "With thine ear, that it hear no evil. "With thy tongue, that it speak no evil. "With thy hands that they cemmit no evils. If the Federalists will follow this commandment, they will leave off lying. So what? I hear you cry. Thomas Paine must have been to Japan. But Japan, at the time, was under Sakoku, a policy of splendid isolation whereby nobody was allowed in and nobody was allowed out*. Sakoku lasted from 1633 to 1853 so Thomas Paine cannot possibly have known about the three monkeys in the shrine at Toshogu. So where did he get it from? "Look not at what is contrary to propriety; listen not to what is contrary to propriety; speak not what is contrary to propriety; make no movement which is contrary to propriety." Thomas Paine was rather keen on Confucius and he must have imported the phrase directly from the Analects, and not from the three Japanese monkeys. This leads us to the vital question of whether Paine is right to assert that the phrase is older than "Christian or Jew". 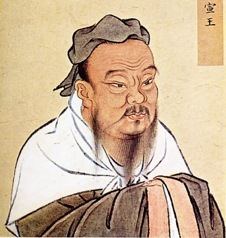 Confucius' birth is usually given as 551 BC, which I reckon is pre-Christian. The word Jew is a shortening of Judaean, meaning the fellows from the Kingdom of Judaea. Israel was united (probably) by Saul in the eleventh century BC. In the tenth century there was a civil war and it split into two halves: one half in the north called the Northern Kingdom and one in the south called Judaea. This situation continued until around 720 BC when the Assyrians came and wiped the Northern Kingdom out, leaving only the Judaeans. So the usual system of nomenclature is that prior to 720 they were Israelites and after that they were Jews. 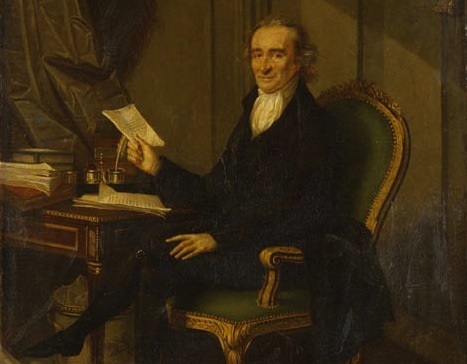 By my calculation this means that Thomas Paine was out in his dating by a minimum of 169 years. *There were limited exceptions to Sakoku, but the prospect of somebody making notes about one sculpture at one shrine is pretty damned unlikely. You have studied the menu and missed the meal. The vessel is not the same as that which it contains.